Why am I having my tooth removed surgically? Some teeth are required to be surgically removed for a variety of reasons. Typically, the tooth is extensively decayed or fractured and is causing chronic infection and discomfort. This depends on the position of your tooth or teeth and whether the operation is being carried out with local anaesthesia alone or with additional intravenous sedation. An appointment for surgery under local anaesthesia usually lasts 45 minutes. When intravenous sedation is used, an appointment usually lasts 90 minutes. The longer time allows for the recovery period needed before you can be discharged home. Sometimes stitches are needed and they are usually dissolvable in 2-3 weeks following surgery. This depends on the operation. If there are any issues in particular to be aware of, they will be discussed with you beforehand. There may be swelling and bruising in the area of surgery, as well as some discomfort which might limit jaw opening. Bruising is usually at its most obvious two to three days after surgery and varies between patients. It normally resolves itself after 10 to 14 days. 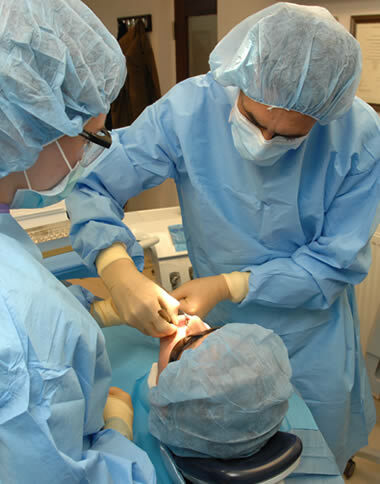 The removal of buried or impacted teeth or roots may be followed by altered sensation in the area of surgery. This is due to the bruising affecting the nerves that carry sensation from that area. This is usually only a temporary condition although it can take up to six months to fully resolve itself. This depends on your occupation and how you are after your treatment. It may be possible for you to return to work the next day. Some people need to take some time off work, especially if the operation has been carried out under intravenous sedation. We will give you appropriate advice for your particular circumstances.